The workshop is hosted by the Department of Computer Science at The University of Liverpool. The conference venue is the Ashton Building (Google Maps Satellite Image). Additional information on the facilities provided can be found here. Liverpool is the main city in the Merseyside county, located in the North West of Englanda along the eastern side of the Mersey Estuary. 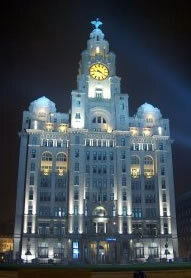 It is the fifth most popoulos city of England with 816,000 inhabitants in the Liverpool Urban Area. In 2007, the city will be celebrating its 800th anniversary, and in 2008, will hold the title of European Capital of Culture. Liverpool is well known for its docks which now house the Tate art gallery, several museums including a Beatles museum as well as many bars and places to eat. Other defining features of the city include two modern cathedrals, a Philharmonic Hall, the oldest China Town in Europe and two famous football clubs, Liverpool and Everton. Maintained by Ullrich Hustadt, U.Hustadt@csc.liv.ac.uk, last updated Wednesday, 15-Jun-2016 12:55:49 BST. © 2001-2006 by Ullrich Hustadt.